What do the Greens think about the current fatigue with representative democracy? Can the green idea of including more people in the political process, and in more ways, address this general disenchantment? GEJ: What are your feelings as Green politicians on the state of democracy in Europe based on your own experiences in your respective arenas, in Belfast and the European Parliament? Ska Keller (SK): When it comes to European democracy there are two levels to it: how it actually is and how it’s perceived to be. Democracy in Europe is perceived as really poor whereas, although it is obviously to be improved, I don’t think it’s as terrible as it’s often perceived. At least, it’s not necessarily worse than on many other levels, whether national or local, but it’s perceived as being much worse. In order to improve the democracy in Europe, I think it’s very important to strengthen the European Parliament, giving it the right to initiate, having transnational lists, making the European Citizens’ Initiative better, as currently the hurdles are way too high for the meagre outcome that you are going to get. It is not simply about improving the democratic links to institutions, like national governments, but rather to the people directly. It is very important that all Europeans feel they have a direct say rather than only through their governments or parliaments on the national level. John Barry (JB): I would describe it as a general alienation within mature democracies across Europe with formal politics, like the party competitive system, national and local parliaments. There is a kind of tiredness of this type of representative government and maybe that is part of the debate we need to have as Greens – how do we not just reform institutions of democracy, but effectively re-found our democratic politics at European, national and indeed local levels? I also think there is a growing context of insecurity amongst many people across Europe, certainly in my own town Belfast, where it is aggravated by the particular post-conflict situation of Northern Ireland, which itself creates insecurity and anxiety. The impact of austerity, the global economic crisis, and a sense of globalisation being out of control all feed into this alienation. As Greens, we have a very strong commitment towards democracy; would you agree that Greens regard democracy as not only a tool, but also as a goal in itself? Do you feel the Greens’ approach to democracy is different in comparison to other parties? SK: Obviously, democracy is extremely important to us Greens and it is a value in itself, but it is also a tool for making policies that are actually beneficial to people. It’s only if you make policies in a democratic way, allowing for people to participate, that the policies can be the right ones. So it is a value in itself but ultimately, the aim behind it is to give everyone the opportunity to participate and to make people’s voices heard. JB: I think we have to remember that democracy is one of the four pillars of the Green movement. What really marks the Greens as being different is that we want to see democratisation, the principle that democracy should extend to as many places of our social lives as possible. 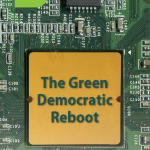 A key issue for Greens is “why should democracy end at the factory gate or office door?” Greens view citizens not simply as taxpayers, nor simply as voters, rather we encourage people to take control of more of their lives in a democratic manner. Ultimately, we want to create a democratic culture and society and not just a formal democratic institutional system which allows citizens to vote. It could be argued that in 1970s and 1980s, when the Green movement was developing, the idea of democracy as a broader social ideal rather than just a form of institutional organisation was more entrenched, while the years following this saw a period of democratic rollback. What do you think has changed? Do you think it is possible to develop a culture of democratic participation in today’s individualistic society? JB: Absolutely, it is so important especially at this time to recognise that the global economic crisis and the crisis within the European Parliament is also a democratic crisis. And so is the ecological crisis around climate change, with its failure to take into account the impact of our way of life. The Green promise of democracy is the idea that we include more people in the discussion around, for example, the real impacts of our energy decisions. Not all problems can be solved by more democracy and democracy as a decision-making procedure doesn’t necessarily guarantee any particular outcome, but on balance it is more likely to produce fairer, more equal and more sustainable outcomes. Among the Greens, there sometimes tends to be an antipathy towards the idea of leadership in that somehow it is authoritarian, which is always a danger, but we should not be afraid of distributed leadership – leadership, not leaders. Currently we are in a media-obsessed era of passivity, where citizens simply sit back and see politics as a spectacle, and I think this has to be dealt with. SK: If you look at the Eastern European experience, this was completely different. In fact we saw a surge of democratic movements in the 1990s. From that experience, I would reject the notion that individualism goes against democracy. What we have experienced is that we cannot have democracy without maintaining the individual freedoms of people, because you need that freedom in order to be able to participate, to have your own free will to express yourself and be able to disagree with others. Therefore, it is very important that people value themselves and others and I reject the notion that individualism is against community. You must be able to have the individual at the centre of policy-making. JB: I think a Green republicanism can answer the question of how we balance the absolute focus on liberty and freedom of the individual but in a common life with others. Democracy is a non-violent way of disagreeing and that contestation is more important than consensus at times and we shouldn’t shy away from it. In some Green parties there can be a fear of dissent, debate, and disagreement, because there is a fear of creating division and conflicts. Do you see that also in your parties? JB: Partly why the republican ideal appeals to me is that I come from a political context which has been very violent and fraught, where dissent was actually dangerous, so you would imagine I should go the opposite way and not want to embrace dissent or contestation, but I actually feel more empowered when presenting a Green, robust version of democracy as people being free to disagree fundamentally, but ultimately respect each other as fellow citizens. That is the key issue, that individualism, dissent and contestation can only really be reconciled on the basis of some degree of solidarity and fellow citizenship. We live a common life and there is a common good and that’s what politics is about, it’s not an exact science. That is why democracy is the only way forward in terms of debate and deliberation. SK: Every party has their own traditions and political history and no system is perfect, also in the German Greens we have had huge discussions about how to make things more democratic and there are always disagreements. Overall, I would say it works fairly well but we are learning and adapting all the time and there is quite a lively debate and, come election time, this sometimes makes things very difficult. But, it is very important that you have lively policy debates within the party. Obviously, Greens agree more or less on what sort of better world they want but the way that we get there is often debated. These disagreements must be brought to the surface and the more space you give to really open debates, the less chance there is of hidden disagreements emerging later. But democracy is never perfect, you always have to keep improving it; traditions that were once really effective might no longer be as valid today. People change, technology changes, and you need to be able to adapt because democracy is only alive when it is moving. The way democracy is implemented by Greens in our own structures says a lot about our ideas on it. Do you feel there is a strong divide in parties today between the professionals, the activists, and the volunteers and are you trying to strengthen the involvement of activists in the democratic process within your parties? SK: The activists are always the most important part of any party and I always find it amazing that the other parties have their party congresses in the middle of the week when it’s clear that no volunteer could come and only the professionals can attend. Whereas, our party congresses are held at the weekend for the purpose of making it possible for everybody to attend. The local party groups depend on voluntary work, especially in the East where we do not have any strong professional structures, it’s all volunteers and the whole organisation depends on them. JB: Our party is still relatively young and small; therefore it is much more egalitarian. We certainly have had discussions around issues that democratic debate is a form of social learning – we need to constantly challenge ourselves. If there was one criticism I would have of the Green movement, having been a member for nearly 25 years, it is that we are far too nice and we don’t challenge each other as much as we should which often leads to a lazy consensus where we all end up agreeing. We suffer in silence which not only builds up resentment, but it means we are not learning and for me, part of the democratic decision making process is about social learning. A broader social challenge is the inability or unwillingness of political representatives and institutions in our current democratic system to adopt a long-term perspective, to address the ecological crisis, for example. There was a proposal for a “Senate for Future Generations” made up of representatives from civil society. Do you think this could be a means to ensure that we meet our sustainability targets? JB: This is one of the major challenges but it is not just an issue of democratic institutions. We now live in a culture of short-termism, which is the opposite of sustainability. At the macro level the way the economy operates demonstrates this clearly – we hear the media and politicians constantly referring to quarters, then at the micro level, there is a culture of consumerism which infantilises citizens resulting in people wanting instant gratification. Meanwhile, the political system at the very most looks at the next election, so it is very difficult to see how sustainability can really be embedded in this system. The Iroquois had what they called ‘The Law of the Seventh Generation’ which urged current generations to live sustainably and work for the benefit of the next generations. With any decision on a road network or energy infrastructure, we need to ask the question “what will be the impact of this three, four or five generations down the line?” I think there are institutional mechanisms by which we can do this, for example a second chamber consisting of people whose job it is represent children, the non human world or to represent long-term thinking. Or we could also have every piece of legislature equality-proofed, like we have here in Northern Ireland – why not have mandatory requirements that large-scale infrastructural changes in society have to be sustainability-proofed? There are lots of democratic innovations we can look at to usher in this long-term thinking. SK: Short-termism is not something new nor is it only linked to capitalism. It’s actually quite natural and understandable from people’s point of view because it is difficult to predict what will happen in one or 10 years time. So the question is, how do we also take into account long-term consequences? Perhaps, it needs the leadership you mentioned to argue for the long-term perspective, but at the same time our whole party was made with the long-term perspective in mind, to look into the future. Take the example of the destruction of nature – it’s done for a short term benefit but results in a long-term loss. But our party is proof that people can and do get together and say “We have to think about the long-term”. I wouldn’t say it’s as simple as saying it’s linked to consumerism. There is also a problem with electoral terms, for instance if you are elected for four or five years you will obviously think in those terms, but at the same time it would not be a good idea to extend election periods to ten years. JB: What’s very unique about our current situation is that we know our continuing carbon addiction, our way of life based on a ‘make, take and throw away’ approach, is leading to medium and long-term consequences. The reality is, unlike previous human generations who could be forgiven for their short-term thinking as they didn’t have the knowledge, we know we are going to run into serious ecological problems 10 – 20 years down the line if we carry on down this ‘ecocidal’ path based on fossil fuel and an economy based on orthodox economic growth. How we as Greens deal with the issue is a tricky one as we can be seen as negative and quickly dismissed as a ‘doomsdayer’. We have to recognise we are in a unique position, that this generation of human beings could be accurately documenting our own demise. We don’t need any more scientific reports to tell us what we’re doing – we know what we’re doing. What we lack is the political will and the imagination to do something about it. SK: We have to be careful about not coming across as if we feel we know better than everyone else what is best for people, because every individual is capable of making their own choices. That is a challenge as not everybody will be convinced, even by the scientific evidence, that we need to lower CO2 emissions. Having said that, the state does have the obligation to regulate behaviour – we have taxes which are levied on things based on what they contribute to society or the harm they cause. There is an obligation as you need state income and it makes sense to tax things which could be harmful to society. You can’t forbid people from taking actions like flying, but you can simply say if you choose an action which is harmful to society then you have to adopt a ‘polluter pays’ policy. Of course, you can’t put a price tag on the living quality of future generations but at least you have people contributing somehow. I also think it’s very important to challenge our notion of freedom. Freedom is not just about owning a house and a nice car; it’s also about freedom to live in a healthy environment, to have your own space for creativity, not having to work huge amounts of overtime – to be able to have the freedom to do other things in your life. We should challenge this notion of freedom as simply the freedom to own and have a broader understanding of what freedom really means. Do you have any concrete institutional proposals for improving politicisation and participation in your society, or do you know of some concrete examples? JB: In Porto Alegre in Brazil, for example, they have initiated something called ‘participatory budgeting’, which allows ordinary citizens or municipalities to have public budgets which are decided democratically by referenda or by street level forms of democracy. This has been experimented with in other places as well. It is about showing people that this is their money, their income and they should have some input into how that money is spent. I also like the idea of worker-owned cooperatives, not just because it empowers the citizens making them more socially aware, but also because they tend to be more environmentally aware and do not necessarily go all out for economic growth because they value the work/life balance. And they can give workers more autonomy, which is another element of freedom – autonomy in places of production and work is something I think we as Greens need to promote. SK: Yes, there are many examples of local initiatives, not all are successful of course but it’s important to experiment with different forms. Local budgeting is one area, but another is communal city planning where if a building is being demolished for example, the citizens get together and can decide what should happen. In Berlin recently, for example, we had a referendum on the airfields and the people decided to keep it free and open for everybody and not build more houses on it. We also have local currencies and digital forms of participation which are really interesting developments and we should always be open to new ideas. Part two of an interview with key thinkers at the Post-Growth 2018 conference at the European Parliament.